What is the Lincoln Way™ App? | Fuccillo Lincoln, Inc.
What is the Lincoln Way™ App? Everyone deserves options, and that's what you get when you use the new Lincoln Way™ App. Whether you drive a brand-new Lincoln MKX or a lavish Lincoln MKZ, you're granted access to this state-of-the-art mobile app that makes owning a Lincoln all the easier, and much more exciting. Learn more about the Lincoln Way™ App here, and if you're interested in upgrading your ride feel free to come to our Lincoln dealership near Clifton Park, NY, where we can outfit you with the car that exudes excellence. The Lincoln Way™ App is a downloadable smartphone application that elevates your Lincoln experience. Whether you own an iPhone® or an Android, you can easily download this app onto your device and enjoy a bevy of options. Our Lincoln Concierge team will help you with whatever you need. What Can I Do with the Lincoln Way™ App? 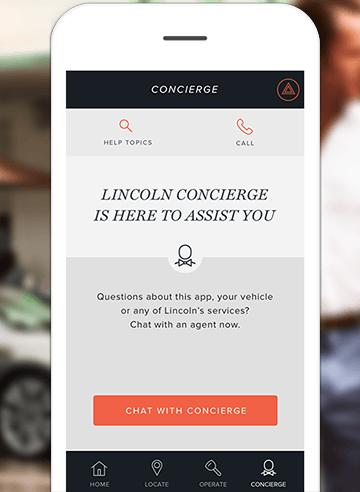 The Lincoln Way™ App works to provide you with a variety of options, from helping maintain your vehicle to a live chat where you can ask the Lincoln Concierge team questions. You can speak with a live agent or you can chat through the app for ultimate convenience. Additionally, we offer door-to-door service for your Lincoln. If you need Lincoln service, you can schedule a pickup through the app and we'll bring you a loaner car and pickup your vehicle. Then when it's finished, we'll bring it back repaired, washed and ready to hit the road. When you're ready to visit the city you can easily find, reserve and pay for parking so you can reach your destinations faster, too. Additionally, you can schedule auto-starts so your Lincoln is ready to roll at a moments' notice. Does My Lincoln Offer the Lincoln Way™ App? The Lincoln Way™ App, with all features, is available for all current-year Lincoln models. So if you're driving a new Lincoln MKC or any other Lincoln vehicle, you can enjoy the latest innovations thanks to the Lincoln Way™ App. Come to Fuccillo Lincoln and find the new Lincoln of your dreams today!